I need two letters written. I am going to sleep now and will choose winner when I wake up in the morning. 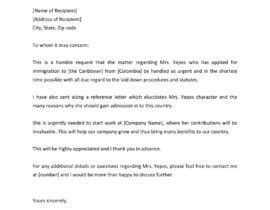 First Letters is to immigration; I am trying to bring a worker from Colombia to Caribbean to work as a cleaner. She is an amazing cleaner and will be great to our staff as she works in a hotel now and has experience. However she is over the age that the immigration requests for living on the island. So I have to motivate why she is a good candidate and why they should make an exception. This is what this letter is for. Name of worker is Yepes. Name of letter to Immigration Services. Coming from Palm Springs. Second letter is I need to get her request handled as urgent as possible. I need a second letter to the immigration requesting that they work on the process as fast as possible to receive a response as soon as possible.